There is plenty of history surrounding London and it is possible to take a short train journey from the city and reach a place which could not be more different. This is the first of a very occasional mid-week series of posts highlighting some of these places. 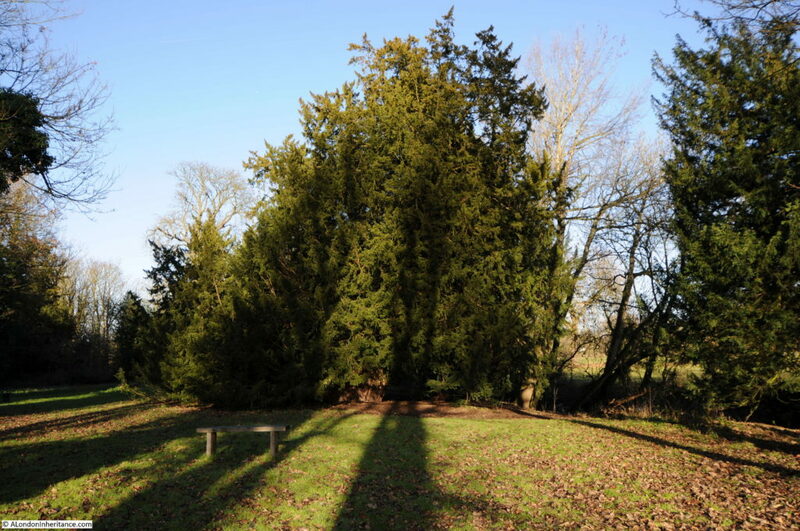 For this first post the subject is the possibly 2,500 year old Ankerwycke Yew tree near the village of Wraysbury, close to the River Thames and possibly the location for the meetings between King John and the Barons which resulted in the Magna Carta. Not only is the age of the Ankerwycke Yew remarkable, but also the location where it can be found. 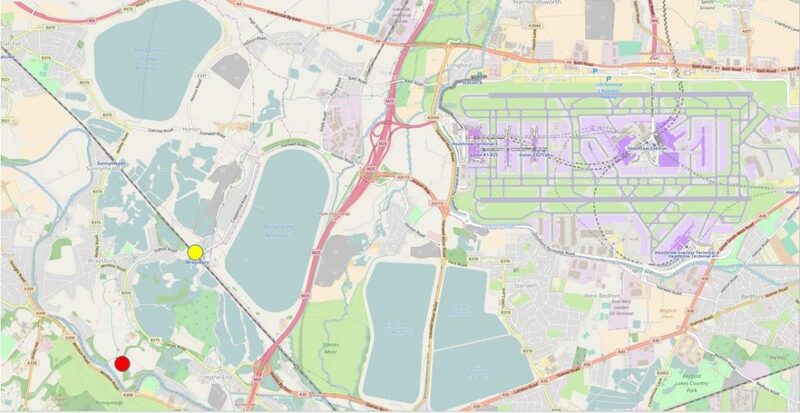 The following extract from OpenStreetMap shows the location of the Ankerwycke Yew (red circle lower left of the map) with Heathrow Airport to the upper right, the M25 running vertically down the centre of the map, the large reservoirs that supply water to London and the lakes where once sand and gravel was extracted to build much of the infrastructure to the west of London are also to be found close by. There is an excellent walk to the Ankerwycke Yew which starts at Wraysbury station (45 minutes from Waterloo station). The station is the yellow circle on the black railway line on the left side of the map. The guide to the walk can be found here. The first part of the walk passes the Wraysbury Reservoir, one of the large reservoirs in this area that supply London. Continuing the water theme, the walk now passes some of the lakes that formed following sand and gravel extraction. The geology of the area is a product of the River Thames, as over the centuries it has changed route and flooded and as a result has left beds of sand and gravel. 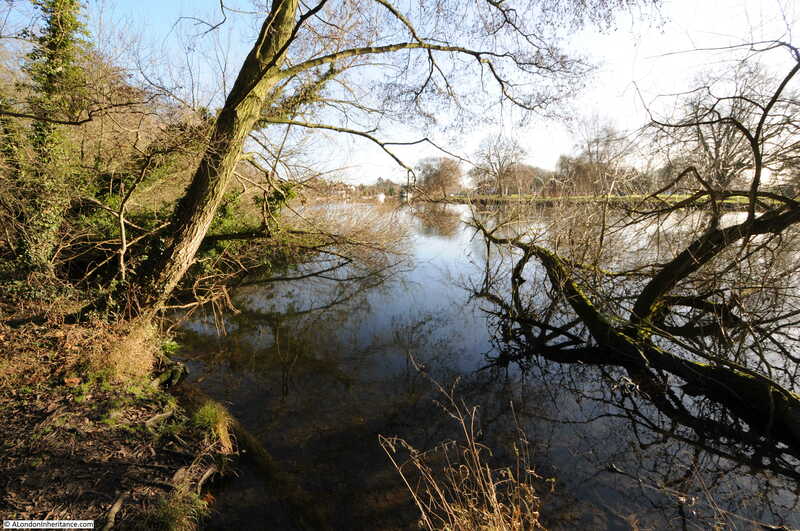 These have been dug out over the centuries, with major industrial extraction commencing in the 1920s when there was an influx of companies into the area around Wraysbury. After a short walk along the Staines Road, then following a track by another lake, the walk reaches the River Thames, although a very different river to the channeled river that runs through the centre of London. 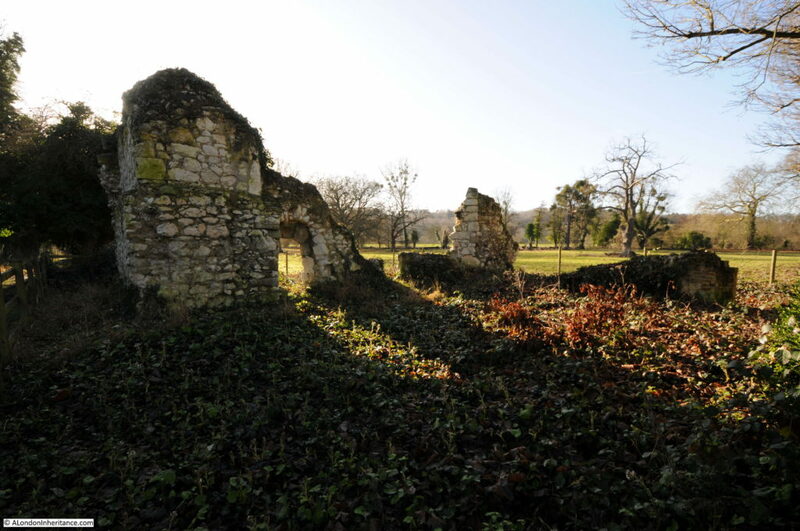 Turning from the banks of the Thames, a short distance further are the ruins of a Benedictine Priory. Dedicated to St. Mary Magdalene, this was a small priory with only six or seven nuns and a Prioress at the start of the 16th Century with an annual income of £20. The Priory was founded here at Ankerwycke around 1160 and closed during the dissolution in 1536. Today only a small part of the old Priory buildings survive. Close to the Priory is the Ankerwycke Yew. There are various dates for the age of the tree ranging from 1,500 to over 2,500 years dependent on the measurement method, assumptions etc. with most estimates ranging between 2,000 and 2,500 years. Whatever the actual age it is very old. 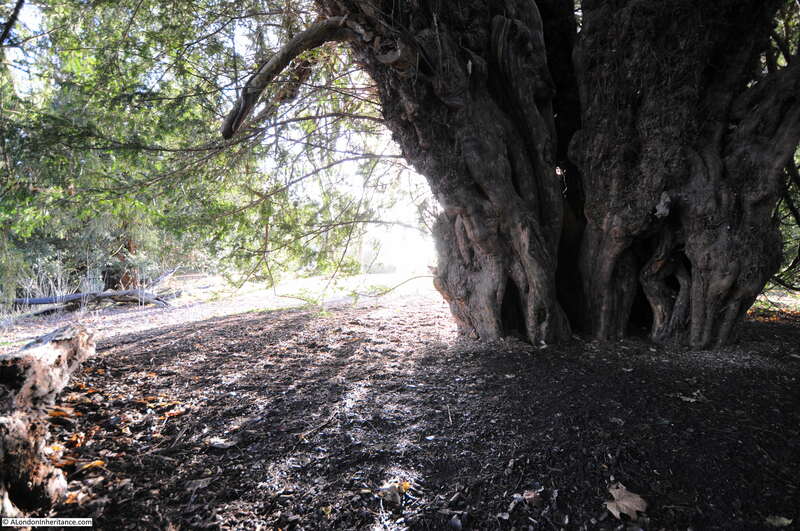 The Ankerwycke Yew is close to Runneymede which is on the opposite side of the Thames and there is some claim that the Magna Carta was signed at, or close by the Ankerwycke Yew. In the 13th Century, the landscape would have been different as the area was probably rather marshy as it was within the flood plain of the Thames. The Ankerwycke Yew is on a slightly raised area of land (therefore dry) and with the proximity of the Priory perhaps both lend some credibility to this claim. Richard Montfichet, Lord of the Manor of Wraysbury was also one of the 25 Barons appointed to monitor King John’s future conduct after signing the Magna Carta. It was Richard’s ancestor Gilbert Montfichet, Knight and Lord of Wraysbury who founded the Priory. 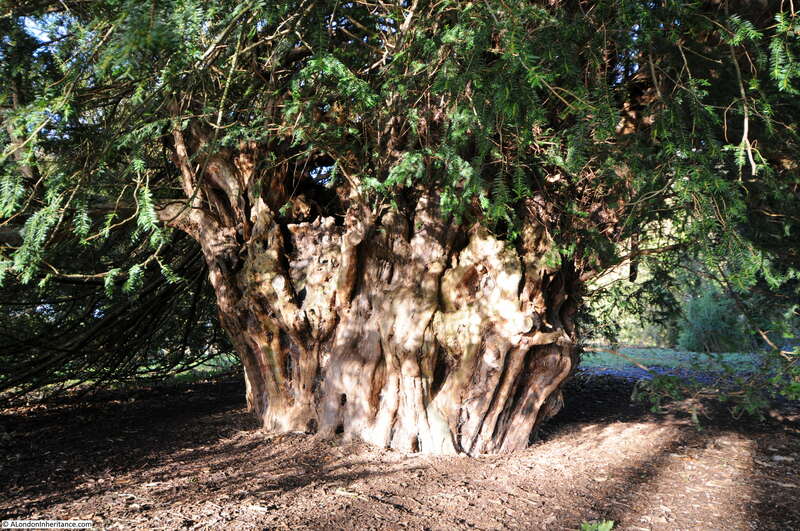 The size of the trunk provides an appreciation of the age of the Ankerwycke Yew. A circumference of 8 metres confirms that this is a tree of some age. Standing next to the Ankerwycke Yew, a living tree possibly well over two thousand years old it is hard to imagine that the M25 and Heathrow are so close and that it is just a short walk and train journey from central London. The sound of aircraft on their approach into Heathrow was the only distraction. The Ankerwycke Yew could well have been a few hundred years old when Roman London was founded. 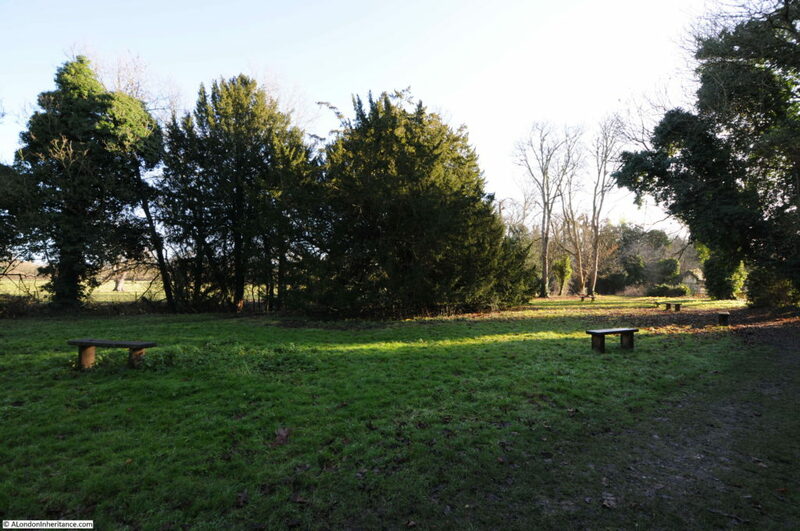 The National Trust have set up a semi-circle of benches around the tree, however even on a sunny winter weekend, there were no other visitors to the Ankerwycke Yew. From the Ankerwycke Yew, it was then a short walk into the village of Wraysbury, a stop at a pub then back to the station having just met a very remarkable tree. This entry was posted in Out Of London and tagged Ankerwycke Yew, Wraysbury on March 2, 2017 by admin. Thank you for all of these remarkable posts! This one had me with tears in my eyes! How WONDERFUL to think that this proud tree still exists. Thank you for all of your posts. Thanks Cerelle – it is a wonderful tree and standing next to it, you cannot help but wonder at what it has seen over the centuries. What a wonderful outing: a train, a walk, a yew, a pub. Hi Geraldine – yes a perfect combination and a good pub at the end is perfect. what an excellent start to an occasional mid-week series. I hope I can get to see this remarkable tree with its equally remarkable place on history’s stage. I didn’t know of it at all. Thank you. Midweek posts as well. You are spoiling us,Admin. Thank you. A visit to see this mighty tree has been added to our places to go list! A definite! I do enjoy a midweek post. And I expect the MC was signed here – there are quite a few instances of trees being used to mark important events or being meeting places. Like the Shire Oak up in Leeds. Or Gospel Oak in London. Yews are wondrous things. BTW, I still keep looking for clues for that strange gatehouse/folly that your father photographed many years ago. One day, I’ll find it. Thank Yew! An ancient tree is always worth a walk. A lovely post to read. I live locally, and dance with a group called Datchet Border Morris (@DatchetMorris). I’ve just got home from dancing the sun up in Runnymede, our annual tradition which takes place at 05:30 on May Morning. We also think Ankerwycke is a very special place – so much so that, while the rest of the world was focused on the heads of state gathered at Runnymede for the 800th anniversary of Magna Carta in 2015, we quietly went down to the Ankerwycke Yew across the river and performed a specially written dance, Ankerwycke, in front of the tree. No fuss, little ceremony, and watched only by a handful of friends and a retired NT ranger, who later shared his knowledge of the Priory with us. It is too late to see us on May Day now, but we will be back in Runnymede at sunrise in exactly a year, and we will be there in the afternoon of 17 June 2017 too. The bluebells were lovely in the woods this morning. And Ankerwycke is always there, not far beyond the end of the Piccadilly Line, quietly tucked away and waiting to be discovered and enjoyed by anyone who ventures down a country lane to find it. Time for a road trip again!